Department of Chemistry, Amirkabir University of Technology (Tehran Polytechnic), P.O.Box: 15875-4413, Tehran, Iran. 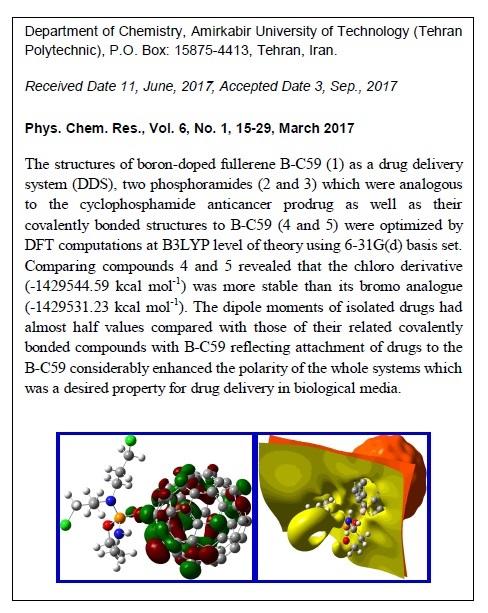 The structures of boron-doped fullerene B-C59 (1) as a drug delivery system (DDS), two phosphoramides (2 and 3) which were analogous to the cyclophosphamide anticancer prodrug as well as their covalently bonded structures to B-C59 (4 and 5) were optimized by DFT computations at B3LYP level of theory using 6-31G(d) basis set. Comparing compounds 4 and 5 revealed that the chloro derivative (-1429544.59 kcal/mol) was more stable than its bromo analogue (-1429531.23 kcal/mol). The dipole moments of isolated drugs had almost half values compared with those of their related covalently bonded compounds with B-C59 reflecting attachment of drugs to the B-C59 considerably enhanced the polarity of the whole systems which was a desired property for drug delivery in biological media. The negative ΔGinteraction values for compounds 4 and 5 confirmed that attachments of both drugs on the surface of B-C59 were spontaneously taken place. The negative ΔHinteraction values for both compounds 4 and 5 reflected these interactions were exothermic (ΔHinteraction<0). The density of states (DOS) spectra disclosed that there were very strong hybridizations between the orbitals of B-C59 and the drug molecules. The oxygen atoms of P=O and P–O bonds revealed  values about 5.0 and 10.0 MHz, respectively that might be because of more positive oxygen atoms in P–O bonds that had a greater interaction with EFG tensor. It was established that the DDS 4 was preferred for the cancer therapy applications due to its greater Ebinding, ΔHinteraction and ΔGinteraction values compared with those of DDS 5.